As seniors at the peak of their SUNY Oswego careers, Boni Quatroche (front) and Abigail Buttacavoli have dedicated themselves over multiple years to leading student organizing efforts for the college's Lewis B. O'Donnell Media Summit, including this year's 14th annual edition, themed "Viral Voices: Advocacy in the Digital Age." OSWEGO — Panelists from the communications and business worlds will explore a phenomenon that literally has put the power to build grassroots movements in the palm of one’s hand in “Viral Voices: Advocacy in the Digital Age” at SUNY Oswego’s 14th annual Dr. Lewis B. O’Donnell Media Summit. The televised event, named for the late, revered communications professor and mentor for such Oswego alumni as Media Summit benefactors Louis A. Borrelli Jr. (who founded the event) and Al Roker, will take place at 3 p.m. Oct. 17, in Tyler Hall’s Waterman Theatre. Senior public relations major Boni Quatroche, co-directing the event with Abbey Buttacavoli, a senior broadcasting and mass communications major, said organizers “came very naturally” to this year’s topic. “For advocacy, social media can and has sparked something huge,” she said. A 2012 alumnus in broadcasting and mass communications, Asa Stackel, morning show co-host at Albany station WNYT-TV, returns to SUNY Oswego as moderator for a panel discussion that will air live on student-run WTOP-TV. Panelists are Brandi Boatner of IBM Corporate Communications, social and influencer communications lead, global markets; Gina Iliev, health equity coordinator for Planned Parenthood of Central and Western New York; Jeff Knauss, a 2007 Oswego alumnus who is co-founder of full-service digital marketing agency Digital Hyve; and Latoya Lee, a sociology faculty member at SUNY Oswego whose research focuses on the ways in which people of color use social media for political organizing, social transformation, the (re)making of value systems and resistant possibilities. 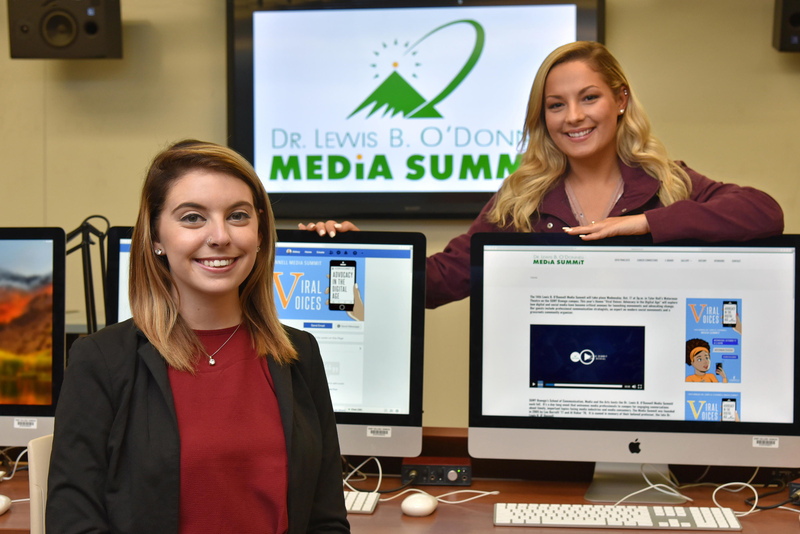 The summit’s 2018 Career Connectors — alumni who share expertise with students throughout the department of communication studies — are Alicia Daddario ’15, sports anchor/reporter at WKTV-TV, Utica; Shealene Guerrero ’16, editorial specialist, Weill Cornell Medicine; Jordan Harmon ’15, director of production, ABC Creative Group; Denvol Haye Jr. ’15, senior account executive, Prosek Partners; and Patrick Malowski ’14, anchor/producer/reporter, WWNY-TV, Watertown. This year’s Media Summit will aim to involve panelists and Career Connectors even more in the day’s worth of activities, Quatroche said. Besides appearing in classes on campus, they will be available for breakout sessions from 9 a.m. to noon in Marano Campus Center rooms 201 and 133. The Career Connectors will do standing networking sessions with students in Tyler Hall’s lobby following the Media Summit’s panel discussion. Riecke credited the event directors, Quatroche and Buttacavoli, for their tireless work — three years for Quatroche and two for Buttacavoli — even in this, their senior year. was the Syracuse Press Club’s Newcomer of the Year. Boatner’s responsibilities include developing a consistent, coordinated approach to identifying top external influencers in global markets and how internal IBM influencers drive engagement around strategic communications narratives such as blockchain, artificial intelligence and cybersecurity. She serves as a member of IBM’s Diversity and Inclusion Council, as the professional development chair — and former chair — of the IBM Black Network of New York business resource group, and as a speaker around the nation and the globe. Iliev works with Planned Parenthood to build, develop and manage strategic relationships — through an equity lens — among organizations, politicians, governments and stakeholders. She came to Syracuse to pursue an executive master’s degree in public administration at SU’s Maxwell School. Her work at the Maxwell School, and in her community, centers on social justice, reducing barriers through grassroots movements, capacity and community building. A speaker, trainer and advocate, Iliev is on the board of the New York Civil Liberties Union. Knauss, a 2007 Oswego alumnus in public relations, spent seven years in broadcast television before founding Digital Hyve with fellow alum Jake Tanner. The company was named the fifth fastest growing marketing and advertising company in the nation, as well as the 57th fastest private growing company in the U.S. by Inc. Magazine. A former Commencement speaker at his alma mater, Knauss is a member of several boards of directors, including the Oswego College Foundation, Food Bank of Central New York, CenterState CEO and the Loretto Foundation. Lee received her bachelor’s and master’s degrees in sociology from St. John’s University and her doctorate in sociology from SUNY Binghamton. Tied to her research and experience as a first-generation U.S.-born citizen to immigrant parents, she is committed to diversifying academic spaces as well as the processes through which knowledge is produced. Lee has been strongly invested in empowering young people of color. She has been invited to speak at various venues, public radio and has shared her work at academic conferences. For more information, visit mediasummit.org.